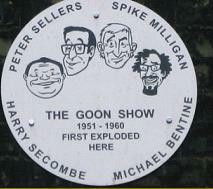 we held "A Grand Day Out" to celebrate the very first Goon Show. We unveiled a commemorative plaque to mark the occasion and had an afternoon of fun, food, and jollity inside the pub afterwards with celebrity guests. Special thanks to Jeffrey Holland, Jon Glover, Peter Stanford, Phil Ladd & Dave Withall for the wonderful performance that they gave us of Goon Show No: 1, to Tim Watson (his grandad was Jimmy Grafton) for the sound system and to Les Drew for the script and the sound effects. November 2013 saw a grand refurbishment of our beloved pub and guess what, they changed the name !!!!! It is now once & for all called "The Grafton Arms" just as it has been known for many years, (albeit should be just 'Grafton's but we'll let them off that one as it's such good news). Many thanks to the landlord Dave Lynch for getting this done for us. 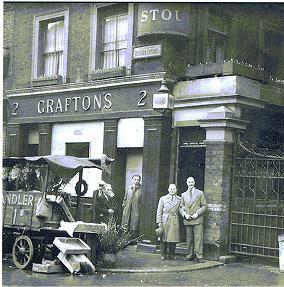 On the left, the pub with it's original name, which you can clearly see was never called "The Grafton Arms", despite that name being quoted over the years. Jimmy Grafton is standing on the right, nearest the gate pillar. It is in Strutton Ground, quite near to Scotland Yard. 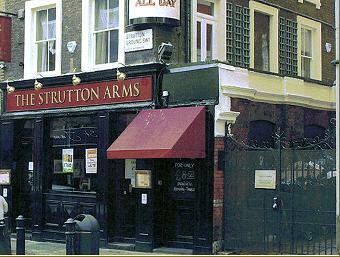 Below you can see it as "Finnegan's Wake" and to the right in its current guise as "The Strutton Arms", still with the gates. The plaque is in-between the two upstairs windows. Our Chairman, John Repsch, along with Les Drew, our other leading light, had both been busy over the months leading up to the Anniversary, chatting to amongst others, the current tenants of Grafton's to see if we couldn't persuade them to re-visit their Goon heritage. (If you recall, the place was gutted some years ago and turned into an Irish Theme pub, Finnegan's Wake then it was re-named again a few years later as The Strutton Arms). Well the current landlord Dave, was very keen and offered us every assistance, so the 28th it was. One of John's first tasks was then to make arrangements for a Blue Plaque* to be created so that on the day we could have a grand unveiling. The cost of having our Plaque designed and manufactured was somewhere in the region of £1100 and what with the money already spent by us on rescuing the "Elton John Scripts", the old coffers are now a bit bare. Please send your donation via post to our Acting Treasurer, John Repsch at his address on the Contacts Page. "The Goon Show Preservation Society"
* It is not strictly speaking a 'blue plaque' as they are usually put up by the Local Authority, so we had our own designed, just thought you'd all like to know that. See it on the Facebook photos.